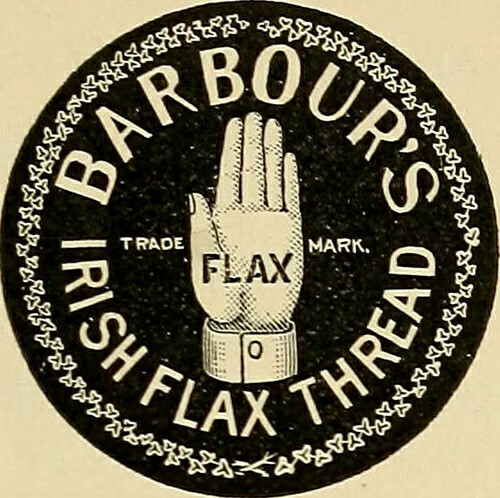 In the mid 19th and early 20th centuries, linen was the staple industry in the north of Ireland. 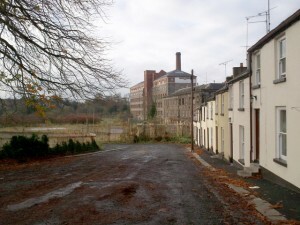 Production of linen yarn and cloth took place in many parts of the country but mechanized industrialisation progressed most rapidly in Belfast where the industry was concentrated. The city had many linen mills and employed mostly women, with men taking the roles of supervisors and managers. A typical working week in a mill could be up to sixty hours, with the working day starting at 6.00 am and finishing at 6.00 pm, with one hour for lunch. 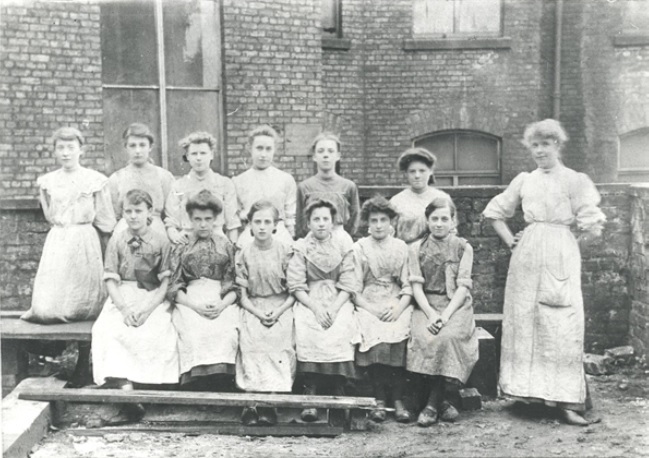 Children as young as eight were employed, most of whom worked under the ‘half-time’ system; a half day in the mill and a half day at school. In 1901, the legal starting age was raised to thirteen and by 1907 there were over three thousand half-timers in Belfast, earning about 3s 6d a week. Most mills were four or five storeys high. Working conditions were harsh and the noise from machinery was deafening. Heat, steam and oil fumes, combined with the fine dust from the linen fibres, made it a dangerous place to work. The Millies, the young girls and women employed in the mill, became skilled lip readers in order to communicate over the noise. 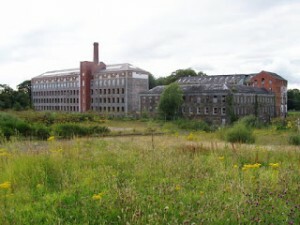 The linen industry went into decline after the Second World War and by the mid-1960s one third of Northern Ireland’s mills had closed. Today, a number of Belfast’s towering mill buildings have been converted to serve the local community and small businesses. Despite the hard lives of the mill workers, there remains a certain nostalgia and many people remember the Belfast Millies walking arm in arm singing their mill songs. In 1912, numerous operatives worked in these conditions and extra hours if an important order needed to be completed. At the close of each shift, the workers would pour out of the mill, their damp clothes sticking to them, weighing heavily on their weary bodies. Despite the conditions, there was great camaraderie and many had a spring in their step and were happy to be outside breathing fresh cool air once more. Now they could begin to live their other life outside the drudgery of the mill. Helena Blunden was one such Millie and loved to talk with the other women. Every day they would sing at their machines and mouth across making funny comments to one another. Somehow, they kept each other going through the hard work and the long, tedious days. The work was exhausting and relentless but, at sixteen, youth was on Helena’s side and she knew that this was not her destiny. She had told her fellow millworkers that she was born in Ireland but brought up in England since the age of five. When her family returned to Ireland in 1911 to seek work they lived in a small terraced house close to the mill. Her father would have preferred to live in Dublin, him being a Home Rule man, but they had relatives in Belfast who had found work for them in the mill so that’s where they settled. Helena was a dreamy idealist; an outgoing young woman, with a pretty face and a friendly smile who loved the romanticism of poetry and the clever wit of the Irish playwrights. She’d told her mill friends of the raucous songs of the London music hall, which her mother had played for them on the old piano, but her real love was for classical composition like ‘Pie Jesu’ and her beloved Irish ballads. Helena loved to tell the story of her great uncle who had been a wandering minstrel in Kilkenny and fond of the dance; a talent that she had inherited herself. But her passion was singing; it seemed like it was in her blood. She was highly praised by those who heard her and that gave her the confidence to believe that one day she would earn her living by singing. But such golden promise was to be cruelly cut short, for Helena died in tragic circumstances at a young age. I have written a fictional short story about it and that will be my next post. Great sadness followed Helena’s death. The tragic loss of potential for what she could have become was felt deeply by her friends in the mill and by her devoted family. They grieved for the beautiful girl and for the great talent that had died with her. Many years have passed and the linen industry has all but died too in Northern Ireland. A visit to the mill shows that little has changed since Helena’s day. The glass still rattles eerily in the window frames when the wind blows. The lift gate howls like a banshee when it opens onto a floor. The reminders of the past are everywhere. The lift, staircases and windows which were installed in 1900 have never been altered. Yet, the workers now based at the old mill where Helena worked are haunted by unexplained encounters. Strange eerie sightings – voices, lights and sounds. All have been reported and continue to be monitored. Does Helena’s spirit still haunt the mill where she died? Many say her ghost still walks the mill. Doors have reportedly opened and closed without reason. Lights have been seen flickering and unexplained noises and movements noted. It had been Helena’s intention to leave the linen mill forever and establish herself as a singer. We’ll never know whether she would have succeeded or whether she was destined to remain in the mill for many years to come. The vast spinning room where Helena worked is now a book warehouse but it’s rarely used as staff are reluctant to spend too much time there.